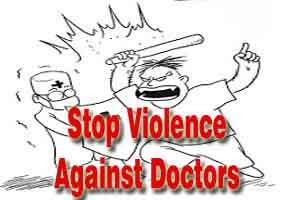 Pune : Two medical residents working at the Sassoon General Hospital, at BJ Medical College were brutally assaulted by the relatives of an alcholic patient that died at the facility. Moreover, to add to the misery the relatives also went and filed an FIR against the doctors, alleging that the doctors threatened them. ” The patient was in serious condition at the time of admission only. This was duly informed to the family of the patient including his wife. The doctors had followed, due protocol and taken proper consents, wherever necessary. Even after that when the patient didn’t survive, the family of the patient began alleging that they had not been informed about the condition of the patient, and then began assaulting the doctors on duty,”informed Dr Kanharam Patel, MARD President, BJ Medical College. Post the incident the relatives of the patient, now identified as Tanaji Kondiba Sakat, a rickshaw driver and a resident of Hadapsar then went to the police station and filed an FIR against the doctors. Incidentally, this incident came just hours after The Maharashtra government informed the Bombay High Court today that it had decided to post four armed policemen round-the-clock at 16 government hospitals in the state to provide security to resident doctors who face the risk of being assaulted by relatives of patients. It is really sad that these kind of acts occur in India. These relatives who are so concerned now where were they all through the life of the patient when he was drinking alcohol and burning his liver if they had done the same to him when he was drinking alcohol he would not have died today, why Blame doctors?????? when will govt understand that assault on doctors are due to poor infrastructure and non presence of senior doctors in wards.